I have a friend that has a pan that only cooks the top of muffins and cupcakes. Her family only likes the top part, so the pan is perfect for her. We are full cupcake people, so I never saw a need for that pan until now. 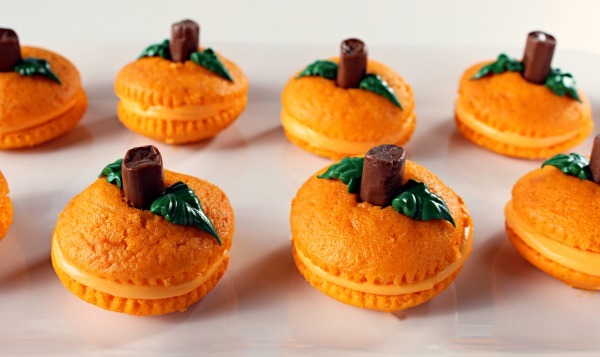 These cute pumpkin cupcake poppers are made with just the top of the cupcake and they are super cute. I bet the idea would work on whoopie pies too though. And you don't have to worry, because the rest of the cupcake won't have to go to waste if you use a traditional cupcake pan. You could use the cake to make cake pops or you could make these cute Jack-o-lantern cupcakes too! You can check out how to make both the pumpkin cupcake toppers and the jack-o-lantern cupcakes over at The Bearfoot Baker. Wow yummy and delicious! I lvoe cakes so much.